An advertisement for 'Winfield Hall', the Frank W. Woolworth estate designed by C.P.H. Gilbert c. 1916 in Glen Cove. The advertisement dates from after the death of Woolworth but before the house was sold to Richard S. Reynolds, founder of the U.S. Foil Company. Click HERE for more on 'Winfield Hall'. Click HERE to see 'Winfield Hall' on google earth and HERE on bing. Click HERE to see the house that preceded 'Winfield Hall'. Advertisement from Country Life, 1927. Grand though it is, and fascinating as the house of one of the great tycoons of the day, this is nevertheless just a difficult place to love. Awkward and cold. As a near neighbor of Winfield Hall, its fate is much on my mind. It has been owned for the past several decades by a brother of former New York Governor Hugh Carey, and he has allowed it to fall into a truly shocking state of disrepair. It has been on and off the market for years at a price so ludicrousley high that respectable real estate brokers won't touch it, and the few credible offers that have been received have been turned down out of hand. Given that the severely dilapidated house is a landmark and can't be torn down, I think that the place is unsalable at any price. While Winfield is not my most favorite house, it has been horrible to watch its decline under the hands of a misguided, mule stubborn eccentric. And, to add the proverbial "insult to injury" Carey has placed large, plastic gilded letters over the front gate of Windfield, proudly spelling out his name, instead of hiding in shame over the horribly degraded condition of his property. 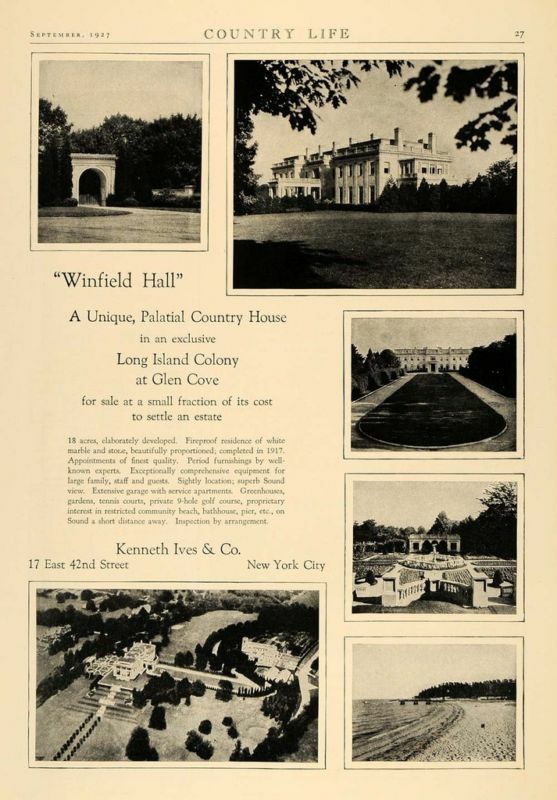 By the way, before moving to Winfield, carey apparently lived at Bogheid, the magnificent Delano and Aldrich Helen Porter Pryibil house on the Glen Cove/Locust valley border. The house was all but abandoned as far back as the mid 1970's, but that didn't seem to faze Carey and his wife who lived there, sans running water, I am told, before moving on to Winfield. And with that, Magnus has answered another of the eternal questions---how do people let these houses decay? By exercising unreasonable real estate expectations. Magnus, is this the same Carey brother who owns 'Sea View Terrace' (the 'Dark Shadows' house) in Newport, now used as a dorm for Salve Regina, and also in a pretty advanced state of decay? I know nothing of Mr. Carey but based on the comments already made will offer there must be some sort of mental defect in people who would rather watch a thing of significance deteriorate rather than turn it over (at a reasonable price) to someone who would properly care for it. I suspect if asked Mr. Carey would tell you he loves ‘Winfield Hall.’ I say this mostly because of a similar situation in my own family regarding a historic house – much smaller scale. • The exterior is grand but not really attractive (at least not to me). But the marble entry hall is beautiful & should be saved regardless of what happens to the house. There, my two cents for the day. Zack- if you can, publish a photo of the house that preceded Winfield Hall. My guess is that to take advantage of a view of the LI Sound (which the house had before the trees grew up) and the prevailing breezes in a pre- air conditioned era, Gilbert designed the original house narrow and long. The house was destroyed by fire, and Woolworth summoned CPH Gilbert back to design the existing monolith. It is interesting to see how different at first glance the two houses appear, yet how similar on closer inspection. It's hard to escape the feeling that Woolworth's instructions to Gilbert weren't, "build me what you did before, but in marble and ormolu". It's also the eeriest mansion around, with a dark history during its early days. A security guard during the Pall Corporation days told me about always hearing odd noises and voices at night. Monica Randall's book on the place says as much! In the past I've been there, alone, and particularly on the second floor I felt like I was being watched! When we first moved to the area, Winfield was owned by the Grace Downs "Charm" school (if that isn't a hoot, you tell me what is). Aside from the elusive elements of "charm", they also apparently taught their students the skills of airline hostessing for some of the smaller, regional airlines that didn't maintain their own Stewardess universities. When Grace Downs closed (early 1970's? I can't really remember), they held an auction on premises of the remaining contents of the house, including a great deal of Frank Woolworth's gaudy reproductions of pretty much every style of furniture known to man. Our haul? A huge, gilded convex mirror composed of plaster grape clusters and leaves. Did my father pay $400 for it? I don't think much more and it may have been much less. It still hangs in my front hall. The Metropolitan Museum might not be hounding down my heirs for it when I cool, but I still rather like the damn thing. For anyone who’s interested, the ‘Wall Street Journal’ has posted some additional photos of ‘The Moorings’, which Zach posted on May 18, 2011 (the house with the surprisingly good looking infinity pool: http://online.wsj.com/article/SB10001424052702304392704576377900749976250--LESS.html#close . I am amazed to see how close to the two streets this mansion is. Are they relatively new since the mansion was built? I am enjoying the stories. I have seen this one for sale for a long time. I have a question on another manison. This one is in Upper Brookville on Mill River Road. It also for sale and has been for a long time. It is now a short sale for 6.75 million. The address is 55 Mill River Road. Does anybody know the name of it and some of the history of it? I went to the anniversary celebration of the John Teele Pratt estate, the Manor House. At the house, there was small room filled with memorabilia from times past, including a dress that once belonged to Edna Woolworth. I struck up a conversation with a mother and son who were also viewing the exhibit. They had both worked for Pall Corp when it was quartered at the Woolworth mansion. They both had stories to tell. The son said that he, on more than one occasion, saw the ghost of a young woman in a blue dress walking in the garden. He said that he stared right at her and she looked at him , and then turned and faded away. I live in Glen Cove and have seen the house many times; it is an eerie place! Well, Charles, it's good to know that my "eerie" post has some degree of validation here! Never saw a ghost, but the whole mansion seems sad. Woolworth himself was steeped in the occult, and the mansion has various symbols reflecting that, particular in his private bathroom. Much of the sadness involves the apparent mental breakdown of his wife, who was confined to a second floor room, and the suicide of one of his daughters. Ironically, a 5&10 Woolworth that I knew as a child in the '60s was one of the happiest, charming places that I remember! OMG - there's that annoying whining noise again. Give me 20 or 30 mill for taxes and free access to unlimiited OPEC heating oil and i'm moving tomorrow. i'll leave my place to DED. i think this is another prime iconic example of "i've got it and you don't" esp the marble hallway. cold, dark - eh - who cares - it's gigantic, opulent, in bad taste- i love it. one of my all-time faves even if it is too close to the road and the great unwashed. we'll get them with the boiling oil from the roof. i also think the predecessor was a good example of even good architects have bad days - probably fire was the best cure.CPH may have set it himself ("what was i thinking - i'll never smoke that stuff again"
be careful what you wish for - he might sell both Bogheid and this to Brodsky. security word def - "derecias" - a not well known Italian school of painting that specialized in painting people from behind esp. women. Aha! I knew you were holding out. Give me Winfield Hall or give me death! Even before my interest in the LIGC as a young child I wanted a house with ten bedrooms so I could have the luxury of something different every night. I love the concept of the plain hallway knowing behind each door would be a wonderland of the appropriate decor. However NO TWIN BEDS! Woolworth I recall had wanted waterfront property but couldn't acquire it so he settled for the Crescent Beach location. Anonymous June 13, 2011 10:48 AM - the roads do appear close but my understanding the road drops off steeply on the east side offering limited views for anyone brave to go down the private road. Magnus I have no issues with reproductions. The quality must be good to merit its prominent place in your home??? i was unable to that site to come up, is the address missing a digit? I like the current "Winfield"...ghosts,opulence and all....but I find the original spectacular!!! I wish they both still stood. I have mentioned this before... Look at the wide overhead shot. Bottom left corner you can make out what i believe was a open-air theater built into the side of the hill. Here is a link to "Seaview Terrace" pictures from the last few years. There is even a picture of Mr. & Mrs. Carey (1995). I hope this works!